Time and temperature are two critical components to any recipe, especially as we enter the biggest cooking season of the year. A few minutes on either side could mean the difference between a flawless dish and a result that is either undercooked or… extra crispy. Best case? Your oven works like a dream and your turkey comes out succulent and juicy. Worst case? 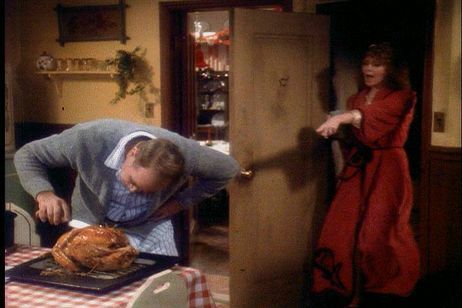 Your bird looks like the one from A Christmas Story. And, unless you have your oven re-calibrated on a regular basis (we don’t either), it’s very likely that your oven temperature is inaccurate. With Thanksgiving around the corner, we couldn’t think of a better time to talk temperature… specifically, thermometers. Thermometers can fall into any number of categories. Today, we’ll review two options that would serve your Turkey Day menu well: oven thermometers and meat thermometers for use in the oven. 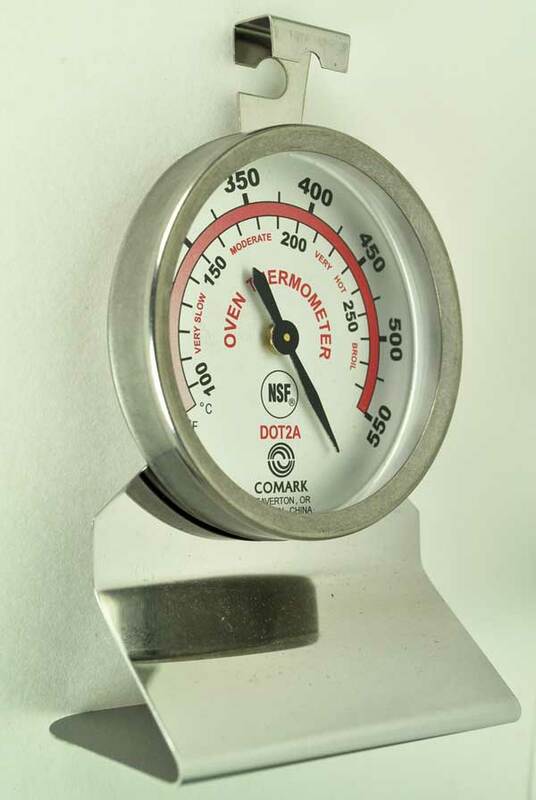 A standard oven thermometer, which can hang from, or rest on, your oven rack. As we mentioned above, a surprising amount of home ovens are not calibrated correctly, meaning that what your oven thinks is 375° may actually be, say, 320°. The best way to ensure you are cooking at the correct temperature, outside of having your oven professionally re-calibrated, is to grab an oven thermometer. These are simply an alternative to your oven’s own measurement, allowing you to independently verify the correct temperature. Like the Gipper said, “trust, but verify”. The scales on oven thermometers generally correspond to the temperature range of your oven (usually up to 550° F), but high heat options do exist, such as the CDN thermometer on this page, which reaches 750° F.
Oven thermometers are a really cheap way to ensure you’re cooking at the right temperature. We recommend them for everyone, no matter the season. The names are fairly self-explanatory — leave-in thermometers can be left in the meat to measure the temperature at a constant pace while cooking, while instant read thermometers are poked quickly into the meat to give an almost-immediate reading. We recommend leave-in thermometers for long-roasting meats like turkey. Leaving a thermometer in also means leaving in all those juices, which would otherwise be lost if you poked and prodded the bird with an instant read. However, instant read units certainly serve a purpose, and are usually the ones you’d see clipped to a chef’s coat in the restaurant kitchen. Brands vary, with some offering either a digital or manual read out (some also offer both). Our personal favorite is the Polder Dual Sensor In-Oven Thermometer, which measures the internal meat temperature, along with the outer temperature of the oven itself. It also comes with a handy, quick-glance temperature chart for various meats, right on the dial. It should also be noted that most meat thermometers have a limited temperature range to accommodate the foods they are meant to measure. 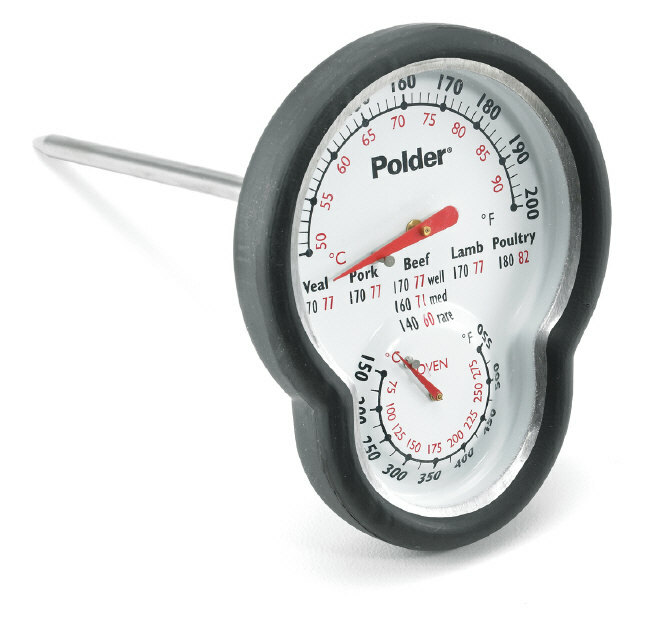 The Polder thermometer at right, for example, measures internal meat temperature from 120° F to 200° F. This is one big advantage of instant read thermometers — their capacity generally reaches a wider spectrum of temperatures. Turkeys have plenty of real estate to cover. Most of that surface will be covered with butter or another delicious brine or marinade, but it’s also important to find the sweet spot to place your thermometer to get the best and most accurate reading. The stem of the thermometer should be placed in the thigh muscle just above and beyond the lower part of the thigh bone. It should not touch the bone, and should be pointing toward the body. However, the thermometer can also be placed in the thickest part of the breast, just above the rib bones, or in the center of the stuffing. 180° to 185° F deep in the thigh; also, juices should be clear, not pink when thigh muscle is pierced deeply. 170° to 175° F in the thickest part of the breast, just above the rib bones. 160° to 165° F in the center of the stuffing, if turkey is stuffed. A thermometer exists for virtually every kitchen task: beverage thermometers for coffee and tea, wine thermometers for oenophiles, deep fry thermometers for the tastiest of fried treats — the list goes on. This little primer merely touched on meat, oven and instant read options that could be handy for your Thanksgiving feast. More info can be found on our thermometers here.